Tight power and cost constraints make reducing the numbers of processors in an IoT design important. The term Internet of Things (IoT), which used to be used broadly to describe almost all connected devices, can now be seen to fall into two segments: Critical IoT and Massive IoT. Critical IoT refers to mission-critical applications such as automotive communication, industrial machines, and medical procedures where low latency is crucial, while Massive IoT is related to the billions of connected devices that include end-node devices. These end-node devices usually have tight power and cost constraints. Synopsys’ DesignWare ARC EM9D core is uniquely positioned to deliver both controller and DSP functionality within a very small footprint. Based on a three stage pipeline micro-architecture, the EM9D processor can achieve up to 4.0 CoreMark/MHz performance and 1.8 DMIPs/MHz. 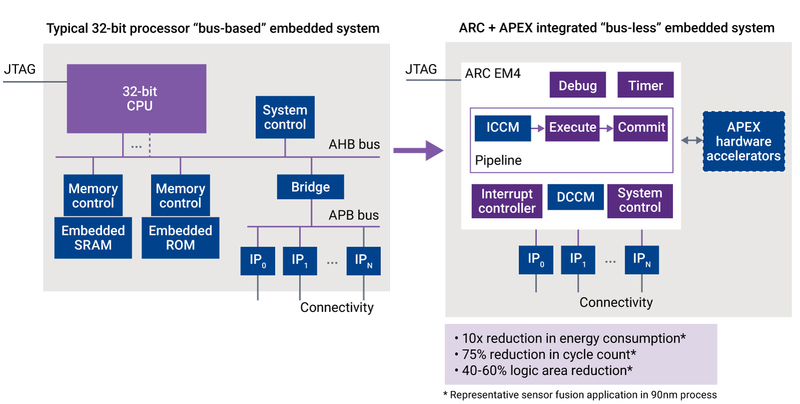 With the ARC EM9D processor, multiple operations are fused into one instruction and executed in a single cycle. This yields high computation throughput and very small instruction memory. Fused instructions can, for example, load multiple data vectors from memory, perform an operation on this data (e.g., multiply accumulate), auto-update memory pointers and store the data, all in one instruction. This enables the core to perform up to seven operations in a single cycle. The processor can perform two MACs per cycle, allowing high vector data computation throughput. The ARC MetaWare Compiler fully supports the fused instructions and will automatically map them from C code to execution code instructions. The processor has an optimized instruction set architecture (ISA) for end-node IoT applications. For example, a set of instructions for data streaming in and out of core data memory allows data bits to be read and written directly from/to data memory without pre-packaging bits into words, which is ideal for connecting to low data-rate sensor interfaces. Because of this architecture, optimized ISA, and high-performance data throughput, it is an extremely computation-powerful DSP. The EM9D core can execute a software algorithm for facial detection CNN computation in only 40 kcycles. Along with data memory size and configuration, the instruction memory size is also another important factor affecting system area and power consumption. A highly efficient ISA, coupled with the efficient mapping of the instructions and scheduling by the compiler, provide around 15% to 20% smaller code size. On top of this, the fused instructions significantly reduce code size, and hence the required instruction memory size. In addition to optimizing the core and memories, SoC system integration of the DSP is important for optimal performance, power, and area. End-node IoT SoCs can range from quite simple to highly complex and sometimes the traditional modular SoC interconnect system adds gate count, milliwatts, and cycle budget overhead that can also be optimized. To further optimize performance, an optional mDMA controller can be added to the processor. This mDMA engine is controlled directly from the processor, but operates in parallel to core execution offloading heavy data movement. With all these features and configuration options, the ARC EM9D processor is ideal for IoT end-node applications that require both control and digital signal processing capabilities. The ARC EM9D offers industry-leading performance per area, coupled with the tight integration options for system peripherals and hardware accelerator blocks, giving end-node device SoC developers the ability to tune the ARC EM9D configuration, memory size, and system connectivity to meet their performance, area, and power requirements.